The Naked Chef once remarked: ‘All I ever wanted to do is make food accessible to everyone; to show that you can make mistakes – I do all the time – but it doesn’t matter.’ He’s right. And while Jamie’s Italian has been one of the most anticipated restaurant openings of 2013, whatever imperfections his first foray into Singapore may have (and yes, there are some), it makes up for by sticking to that core philosophy. You’ll have to look past the overburdened staff tending to the expansive 210-seat restaurant (including an alfresco area that seats 40, complete with an outdoor herb garden) – for the most part, they’re eager-to-please and knowledgeable enough, but the place has unsurprisingly been rammed. Expect to find a queue during peak lunch and dinner times (though even during the opening weeks, it was pretty fast moving) and a middling inconsistency to the quality of the food they’re churning out. But this is, after all, Jamie Oliver. And we all love him. At the end of the day, it’s partaking in the quintessential Oliver experience that matters most – from the charmingly rustic décor to the cute little stories behind the food (the cutting boards serving their signature planks, for instance, are sourced from a hobo called Mike the Woodman) and the sustainably-sourced products (notably, they’ve also collaborated with Archipelago Brewery to create an exclusive beer for the outlet, the Archipelago Evviva L’Italia, $11.50/300ml). While the said antipasti planks – there’s meat ($15.50/person), cured and crispy fish ($17) or veggie ($13.50) options, each with a different selection of cheeses and pickles – are solid options for pre-meal nibbling, the more popular choices are undoubtedly the range of pasta dishes, available in two sizes (the large is ideal for sharing). 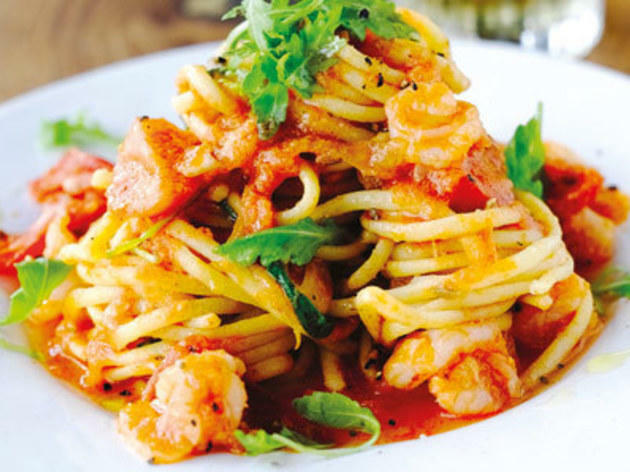 You can’t really go wrong with any option – try the fennel-seasoned prawn linguine (pictured above; $17 small/$25 large) or the tangy Jool’s Favourite Sicilian tuna fusilli ($14/$21, named in honour of Oliver’s wife). They’re expertly prepared and very reasonably priced. You might save a few bucks by going to Pastamania nearby, but not much – and really, why would you want to? For gourmands, the World’s Best Olives on Ice ($7.50) – superbly flavoured specimens sourced from Puglia – will certainly please (though you can debate whether or not they live up to the lofty moniker), as will the crispy squid ($11.50), featuring firm and chewy pieces coated in crunchy batter and served alongside garlic mayo. Less impressive are the bland risotto balls (pictured above; $11.50), stuffed with a dry combination of smoked mozz and mushrooms, and the one-dimensional Brixham Bay crab risotto ($19/$28.50), which the kitchen hasn’t quite mastered. After receiving one order that was over-zealously reduced, our server graciously replaced it with another order that was just about right. If you’re looking for something more filling, the Angus prime rib ($59.50), served with wild mushrooms and a decadent truffle butter, or the smoky quick-seared veal steak caramelised with a layer of prosciutto ($32.50), are both immensely flavourful, though there’s a tendency to overcook the meat a bit. For something lighter, go for the moist and flaky pink snapper acqua pazza ($32). And finally, desserts. Plenty of family-pleasing treats here, including the moist, rich and fudgey Ji Warm Brownie ($11.50, served with vanilla ice cream), which reveals additional hints of raspberry and amaretto. There’s also a wonderfully wobbly panna cotta ($9), which is silky-smooth and works beautifully with the refreshingly tangy mixed berry fruit compote served with it. If it’s haute celebrity chef cuisine or truly wicked Italian fare you want, you’d best look elsewhere. 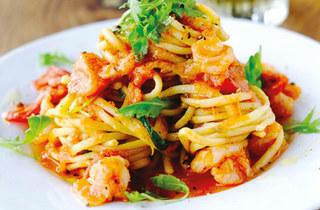 But with a family-friendly atmosphere and cookbook-inspired dishes, Jamie’s Italian delivers. All that’s left is for the Naked Chef himself to pay us a visit and put a stamp on the place. Perhaps there’s something engrained into our DNA that attracts us to anything “famous.” From Ramsay to Rembrandt, names such as these resonate strongly with something within our minds. So what about Jamie Oliver? Let’s do a quick rundown. As an English celebrity chef, Jamie has committed himself to using fresh and healthy ingredients. The aim is to divert from modern use of modern gastronomic additives, refocusing back towards original flavours. Much like Robert Frost’s, The Road Not Taken. Unlike his British counterparts – Heston Blumenthal and Gordon Ramsay – Jamie does not hold any Michelin stars. Needless to say, I was attracted to his all-too-familiar (cookbook) name, resulting in a friend and I having dinner at his Singapore branch. As always, it’s pleasant to start off any evening with an aperitif. At Jamie’s, they offer a tantalizing discount on selected Prosecco, house wine and beer on tap. We ordered a Campari and a Rossini Strawberry, which turned out to be made using Jamie’s own line of spirits. While overly sweet, my Rossini did prepare me for the dishes ahead. If I were to return, a chilled Prosecco or Pinot Grigio would most certainly be my choice. Skipping the range of appetizers, we fast-forwarded towards the mains instead. In true-blue Italian flair, we opted for a truffle tagliatelle and a rotolo al forno. First to arrive was the tagliatelle – swathed in copious amounts of truffle oil and fresh black truffle shavings. Parmesan dotted the surface of the dish, making for an aromatic and eye-catching experience. While nothing negative can be said about the dish, nothing amazing can be mentioned either. As for the rotolo al forno, I was treated to a host of seasonal pumpkin, squash and spinach. Presented in a cinnamon-swirl-styled layout, fresh pasta sheets and tomatoes were paired with ricotta and basil. I enjoyed the blend of Parmesan and breadcrumbs alongside the wholesome flavour of pumpkin. Frankly, I felt that a crack of black pepper would have upped the ante. But no complaints – the dish was otherwise superb. At this point in the meal, I realized that the core of Jamie’s is simply down-to-earth Italian fare. Minus the glitz and glamour of the Jamie’s name, the food served transports you to a small farmhouse nestled in the hills of Tuscany. For dessert, both a tiramisu and a lemon meringue cheesecake were settled upon to finish up the meal. Well, that and a light cuppa. Before diving into the meal, I noticed that the tiramisu was rather poorly presented. Flopped on one side of the plate, it was as if the chef had endured a rather lousy day at work. Fortunately, the smoothness of the coffee-trifle and mascarpone blended well together. A particularly pleasant addition to the sweetness of it all was the inclusion of orange flavours within each layer of trifle. More extraordinary was the cheesecake topped with a generous layer of fluffy meringue. With this cake, I obtained a certain satisfaction from piercing a fork into each layer. First was the meringue – fresh and plump, with crisps of lemon slices wedged in between. Next came the layer of soft cheese followed by a moist graham base. Topped with raspberry sauce and warm vanilla sauce, the pairing of flavours satiated my sweet tooth. Overall, my slice of the pie totaled around $50.00. While expensive for what is a simple affair, I would recommend Jamie’s for when you’re feeling special or up in the clouds. Yet for some, the superb service and quirky setting by the waterfront is all that’s needed to seal the deal.